Most hitters with the length of limbs that Peters possesses have a very difficult time maintaining control over those levers throughout their swing, but Peters is an outlier in that regard. He has very good body control to his swing and shows exceptional feel for the barrel. 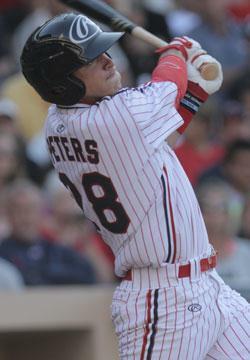 With a short, balanced swing with good extension and bat speed, Peters is likely to hit for a high average at the next level and can also drive the ball with authority when the opportunity presents itself, giving him exciting offensive potential.